The US market has died down a bit after the events of last week. All news were related to the law, signed by the new US president. Apple did not stay on the sidelines and signed opinion on the adverse effects of the law on immigration policy. At the beginning of 2017 the company held more than 70% of the market of premium smartphones, leaving far behind its main competitor - the company Samsung, which is still experiencing problems due to the failure of the Note 7. This segment for Apple is a high-margin, because the margin on some items may exceed 300%. But apart from the race for the profit of the company has always been a leader in social innovation, creating gadgets for the blind. The company's shares in the market continue to rise, and a technical summary of the company actively encourages the purchase. Today, the income from each share is 8.35, and the annual income is calculated at the level of 38.58%. The stock chart clearly shows that after a strong price gap is not very rolled back, and even vice versa simply clung to the resistance level. Such a situation in the stock market occur frequently enough, and they tend to indicate the continuation of the trend. 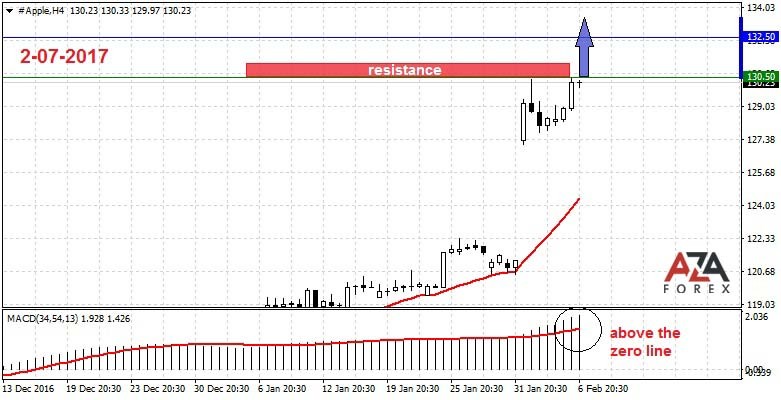 We aim at a distance of 200 points, because further by 50 points, the price may meet strong resistance at the level of 133 dollars per share. Therefore, as soon as the price goes up further, we join by bullish stock market investors.